Curator Mary Jane Jacob was interviewed by NTS at the Sullivan Galleries in the School of the Art Institute of Chicago (July, 2011) where Jacob is the Executive Director of Exhibitions. 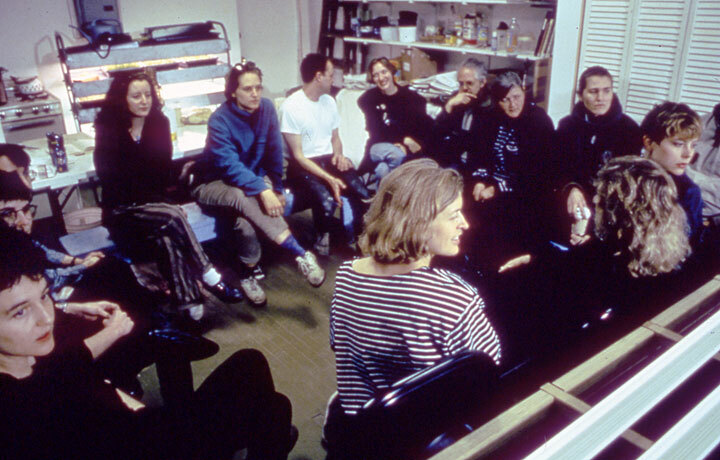 The interview focuses on the work leading up to and during the ambitious “Culture in Action” project organized for Sculpture Chicago, which took place over a two-year period (1991-93). 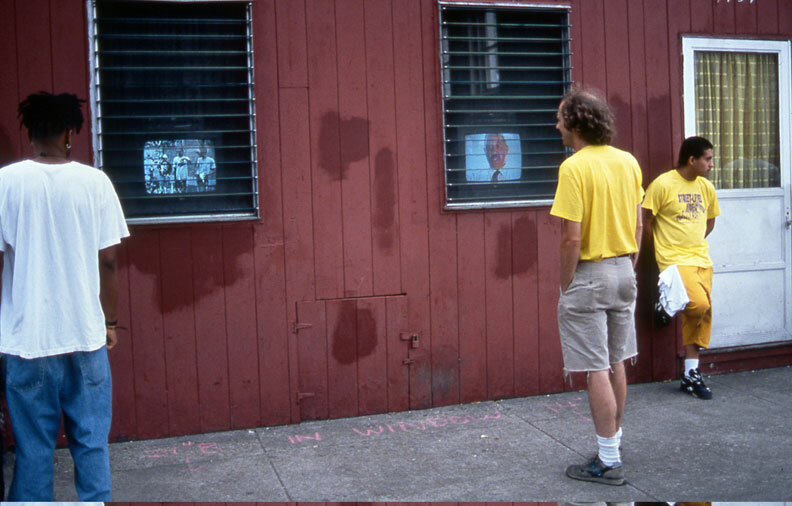 For the project artists worked in direct partnership with community members to explore the changing nature of public art, its relationship to social issues, and an expanded role of audience from spectator to participant and offered a new model for art in the urban context. A publication by Bay Press, Seattle, traced these multi-layered projects that took the form of monuments, parades, candy bars and billboards, hydroponic gardens, and a permanent youth media program. Herbert Muschamp, architecture critic for The New York Times, wrote that these “conceptually oriented public artworks update the City Beautiful tradition of integrating fine art into the urban fabric… using art and urbanism to reinforce each other” as part of a movement to “think globally, act locally.” The project featured works by Suzanne Lacy and A Coalition of Chicago Women; Inigo Manglano-Ovalle and Street-Level Video; Haha and Flood: A Volunteer Network for Active Participation in Healthcare; Robert Peters; Mark Dion and The Chicago Urban Ecology Action Group; Simon Grennan, Christopher Sperandio and The Bakery, Confectionery and Tobacco Workers’ International Union of America Local No. 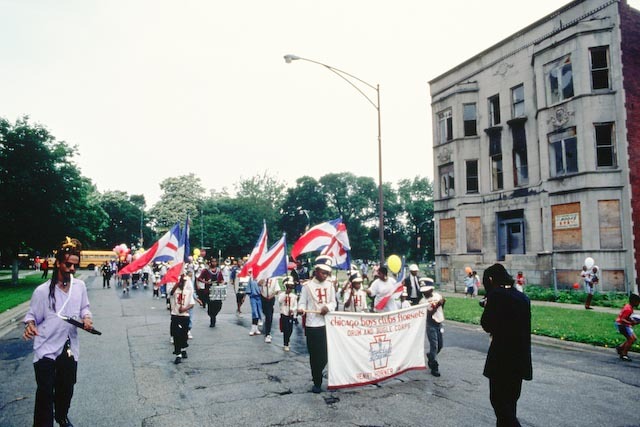 552114; Kate Ericson, Mel Ziegler, and A Resident Group of Ogden Courts Apartments; and Daniel J. Martinez and The West Side Three-Point Marchers. Daniel Tucker (DT): As a starting point could you talk a little bit about what research or projects you were involved in or that you were observing elsewhere that provided inspiration for “Culture in Action”. Mary Jane Jacob (MJJ): It came from a few fronts happening in art of the 80s. 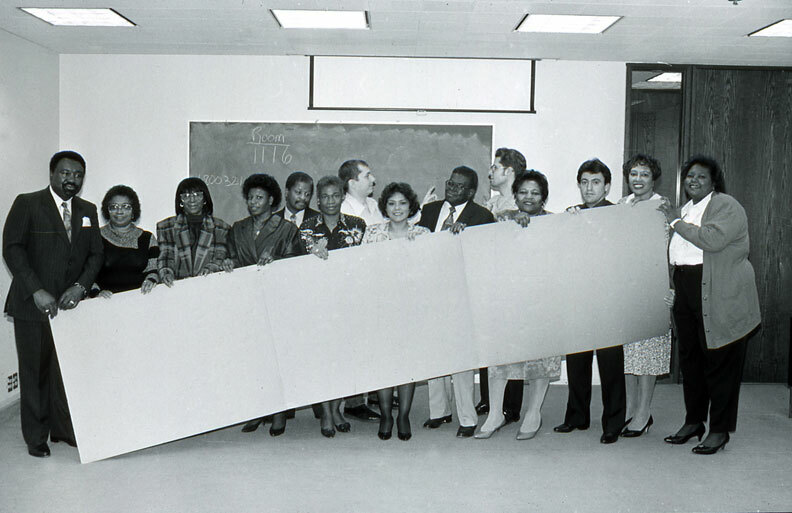 One is straight-forward: NEA and other government public art panels defined how stuff got made in cities at that point, through a panel of expert and local representatives or sometimes just art professionals picking the artists. The process of selection was the short-term (one day) and jury-style that did not value community citizens as relevant. It was one established to ensure “art quality.” Furthermore, the result of that process was that often times the art work never got made or when it did—I suppose this was the greatest impetus to me—it became highly compromised as it made its way through a logistical process that succumbed to the power of site architects or politics. Or because the artist’s distance from the process, it might not be the right work for the context. So that was one motivation from the public art field. Another contributing experience came even earlier. As a graduate student at the University of Michigan, I did an internship as curator of the Michigan Artrain, working on a show from the Upper Midwest. As I met artists in local terrains, I heard about the regional prejudices they faced and how their place—outside the mainstream—labeled them in negative ways and restricted their access to showing. Thankfully, that has changed a lot in the last three decades in large part due to champions like Marcia Tucker. I thought it wrong that they felt compelled to leave the place where they lived and from which they drew their inspiration in order to have a career. It also made me think about place and its relationship to making: What does an artist can bring to the perception of a place. I had also begun working with other artists “outside the mainstream”: women artists, those who employed material associated with crafts for their art, or new genre like performance and installation. Combined with that, I took an interest in art with a political and social agenda. So all of this led to cultivating a kind of curatorial position and with that came relooking at the state of public art. At that time early in my career I also found a dialogue around this discourse with Suzanne Lacy who has certainly been a leader in rethinking the field public art. 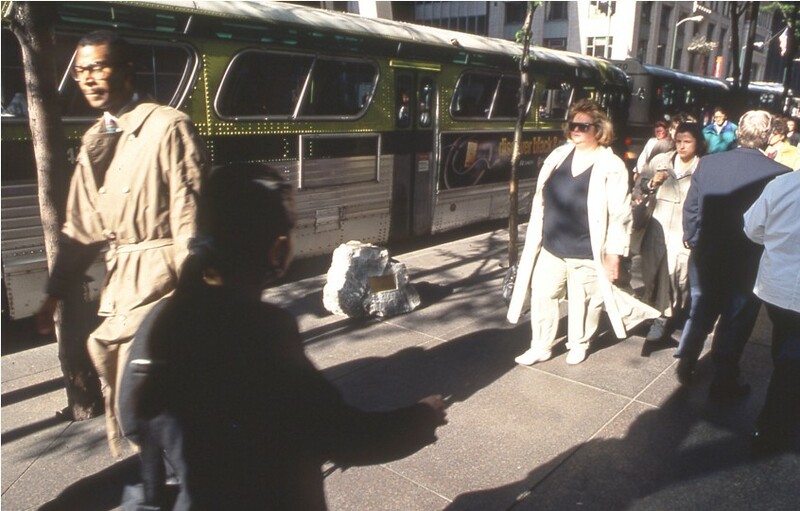 So all those experiences served as some professional background for a critique of public art and set the scene for engaging a conversation with Sculpture Chicago around doing an exploratory program, which eventually became “Culture in Action”. 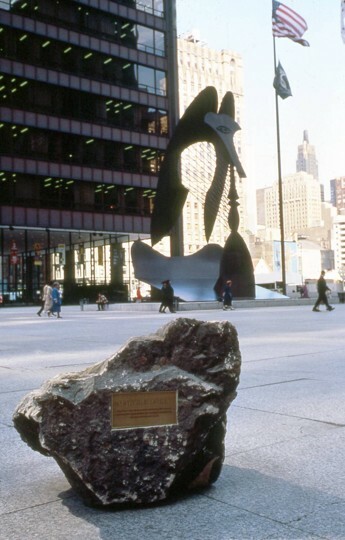 In 1990 I was a board member of Sculpture Chicago. I was also doing a site-specific show in Charleston, South Carolina—“Places with a Past”—where the invited artists were grappling with erased histories of slavery. At Sculpture Chicago I was impressed with the real enthusiasm among that committed board for the work they’d most recently accomplished with Vito Acconci and others. However, their programmatic separation of local and national artists seemed to smack of regionalism to me. Additionally, their “curatorial” process of having jurors select artists based on maquettes of work they wanted to make outdoors seemed reactionary. It didn’t allow for the way artmaking was going. And by focusing art on the plaza, what the public was exposed to was restricted. I thought the process needed to be opened up to another way. But in spite of this critique, at the heart of what they were doing—and what seemed to touch most deeply the heart of the board—was bringing the wider Chicago community into the process by enabling the public to see artists at work. Moreover, the board was moved by stories of other professionals (crane operators, welders…) who had helped the artists in the process and then returned to see the work with their families full of pride and a sense of ownership. The board was excited that non-museum go-ers had an experience with art through what they provided and could even participate in the process with the artist. This was ultimately where the whole process started: with the public. I thought: What would happen if we opened up the process fully to allow artists to do what they do? And what would happen if we really opened up the process to allow the public to be part of that process? How can that be best realized? Not through marketing. To bring people who aren’t usually the art audience into art, I thought, could best be achieved through something personally meaningful to them. (I saw how this was working on the subject of history with my exhibition in Charleston.) So that became the inspirational moment thing that brought all the other art discourses to bear in “Culture in Action”. The critiques embodied in this program caught the attention of the National Endowment for the Arts; there was a feeling a test case was needed to think about public art in another way. It was a moment. But how it was going to happen and what the art was going to look like was hard to explain to funders. It wasn’t acceptable for a curator to work organically, developing a project for which outcomes were not defined. So it became challenging for me to hold the space open for artists to work, for things to emerge, and the public process to unfold—but that was the only way to truly include the public in the process. Furthermore, this is how the creative process goes and as a curator I wanted enable that process. So the fact that we couldn’t describe at the outset where the work was going to be, what collaboration would look like, which artists would eventually become end up being part of the program, who the audience-participants would be, what would be produced was the right process. This meant that all those involved needed to work from a certain level of trust. And for this Sculpture Chicago was the right board; I have never worked with a board that was so involved throughout that whole undertaking. DT: And so most of the funding was from the NEA? MJJ: NEA and also the Lila Wallace Reader’s Digest Fund were the primary funders, but there were other significant ones, too, such as Rockefeller and Nathan Cummings Foundation on the national level, and Polk Foundation and MacArthur in Chicago. Funders were entering in at various points, but it was a good moment for fundraising because people didn’t have examples; they couldn’t quite nail down what we were doing; they hadn’t set up categories of funding yet for such projects. I was willing to go out there and talk about what we aimed to do and why. So if they were curious and maybe inspired, too, they got into the discussion as we tried to figure it out. MJJ: Yes, “Culture in Action” was presented along the lines of potential: potential of what the audience can bring to the art experience, potential of the passion and vision of artists to work in new ways and in public, and the potential for art to be a way of thinking about and dealing with the problems we face. It was also presented as a program that needed to be comprised of several projects coming from different directions, dealing with different ideas and issues. Then what resulted might offer some examples of working relationships and ways to imagine the potential for public art, for art and the public. Funders think about how to design programs that can and serve needs. It’s all well intentioned. Sculpture Chicago board members had the desire to create meaningful, embedded, personally life-transforming experience through art for the public. That wasn’t their mission statement, but it was what they believed in. I approached board members and funders on this level, seeking their best possible selves, and we became engaged in a critical conversation about what could happen: What is art for? To talk in that way rather than do a sales pitch is all I could do as a curator. For some people that worked, and for others, I can tell you, it didn’t because the story I was delivering is too complicated, risky, and murky. With “Culture in Action” I was really up front that we might deliver anything. We were not claiming there would be sculptures or change society, but we wanted to try to see what art can mean in people’s lives. DT: How were the artists in “Culture in Action” identified and what was sort of the process like of connecting them with communities that they end up working with? 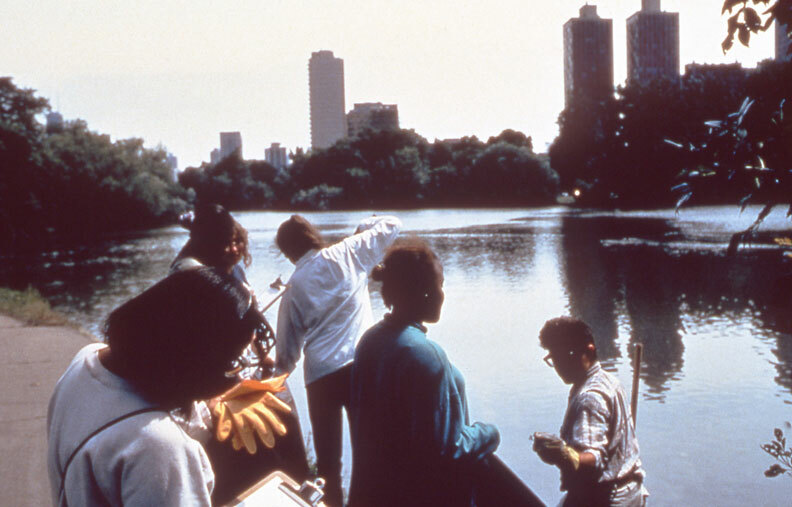 MJJ: In the beginning I was critiquing sculpture in urban spaces, but as time went on notions of collaboration came to the forefront, along with co-authorship among a segment of the population that, before or for this occasion, could be thought of as a community. Some artists came and went in that evolutionary process. My way of working on a group show always involves starting the conversation with a few artists, bringing them onboard to think with me, and not waiting till I have settled on a final list before beginning on the ground. 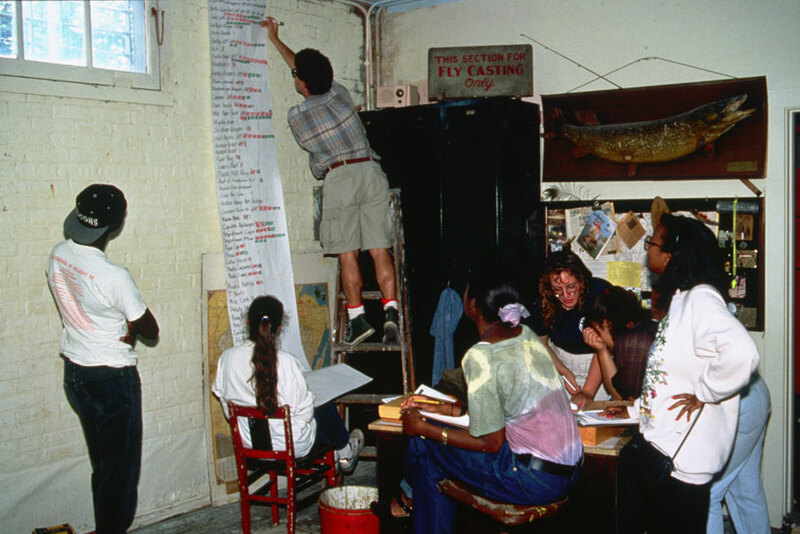 Mark Dion was one of the first artists to begin, and he was certainly the first one to clearly define that he was working collaboratively, having us solicit a group of high school students. Of those who lived outside Chicago, Mark also spent the most time here. He came nearly every week during the school year to lead a class and stayed all summer. He knew what he wanted to do. Ronald Jones had recommended him—listening to artists is one way I select other artists. 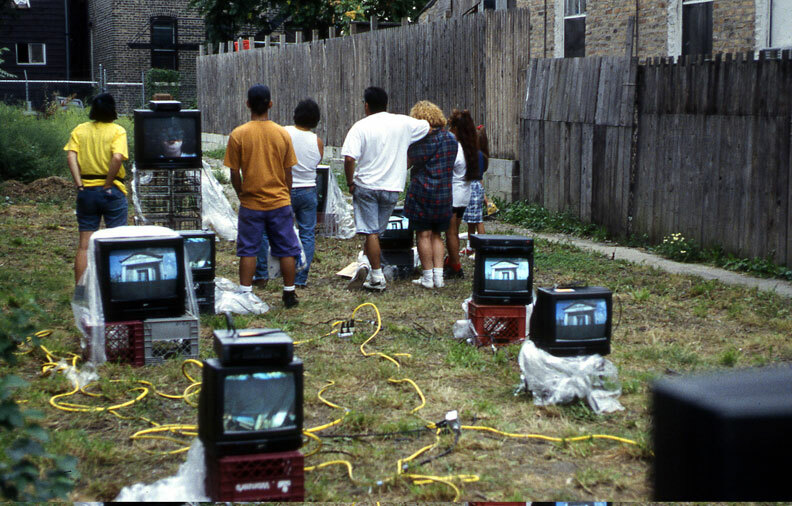 [I had done a work with Ron just prior for Sculpture Chicago, which also helped launch “Culture in Action.”] It was a temporary park in sited on open land left over from building the Harold Washington Library building. His project, Pritzker Park, could have been a permanent, but ultimately was not. 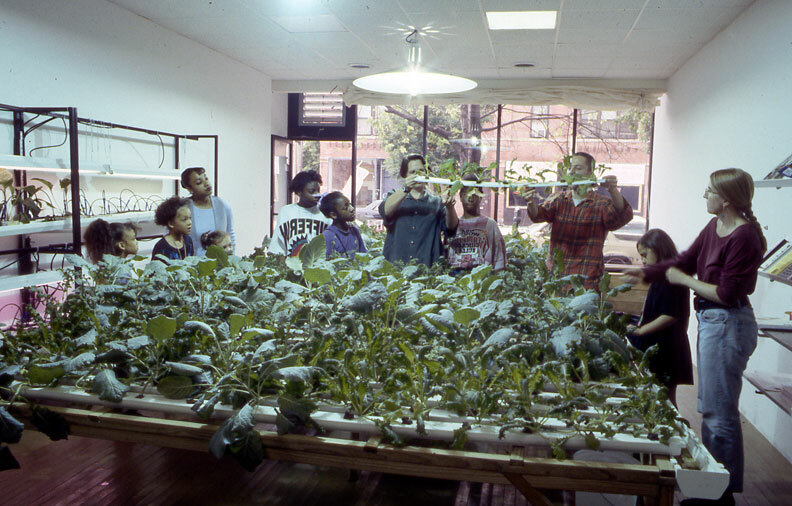 It was largely enabled by collaborating with the head of City Planning at that time, Chuck Thurow, who went on to lead the Hyde Park Art Center and carry out their new building. As to selecting other artists, well, I always loved the work of Kate Ericson and Mel Ziegler and had just worked with them in Charleston where they made a very successful project with a resident, painting his house [Camouflaged History]. I knew they were interested in issues around housing and thought they would find Chicago a good place to work. Daniel Martinez was an artist that I would have liked to have worked with when I was Chief Curator at LA MoCA, but that museum was not open to that. So I invited him here to Chicago. I had worked with Bob Peters in Chicago as Chief Curator at the Museum of Contemporary Art, so chose to do so again here. Haha was a Chicago four young artists already working collaboratively who proved interested in creating a wider collective. Christopher Sperandio and Simon Grennan were just graduating from UIC; their first projects in Chicago parks intrigued me because of their irreverence and critical insight. So I met with them and talked about what they might do. Suzanne Lacy, as I mentioned, was a leader in thinking about public practice and an artist I knew well; we had shared many discussions. I felt that the program overall could benefit from her experience and intellect, and that with her we could build a deeper discourse. DT: “Culture in Action” gets referenced frequently, but a lot of the time it is the idea of the exhibition, and there’s not as much reference to specific projects. I’m just kind of curious if you have any anecdotes or project stories that you think are really meaningful or transformative kind of experiences that happened in “Culture in Action” that are not widely known? MJJ: Full Circle, Suzanne Lacy’s project about women, was centered on the inspirational historic figure of Jane Addams. In the magical, spectacular way Suzanne works best, overnight where there had no Chicgao monuments to women, appeared a hundred monuments in the Loop. These temporary works are often pictured, but the second part was of her project, Dinner at Jane’s, was a dinner among women world leaders, staged and filmed at Hull-House. This part is less known but is what made this work truly come full circle. Grennan and Sperandio’s project ran into some interesting challenges. At one point it looked like it might be stopped when the Nestle headquarters would not allow the workers at their local plant that we had been negotiating with to participate in the art project for one week. It represented 40 hours for 15 people, so to them it was a lot of money, but also maybe they were fearful in other ways. At that time the union was suspicious of the corporation’s new program of “employee empowerment.” It was the head of that suburban Chicago plant that actually gave those workers the week off. He said, “Just don’t meet in the factory.” So we held collaborative design workshops in the offices of Sidley & Austin made available by Sculpture Chicago board member Jack Guthman. 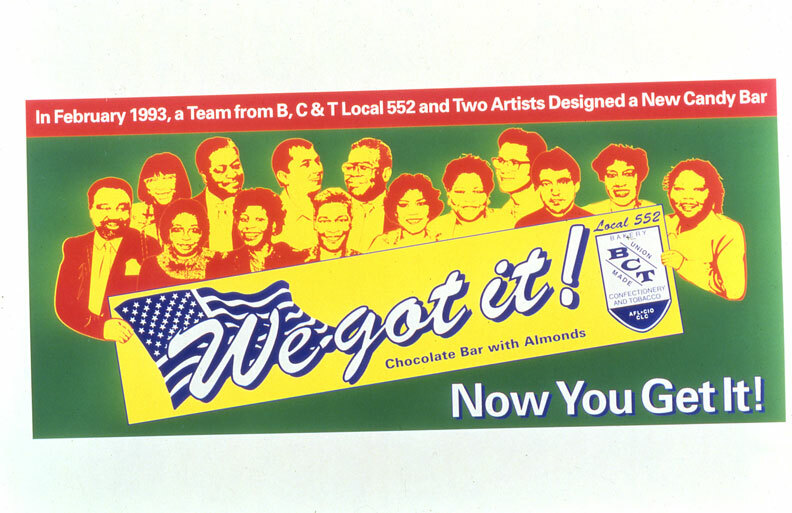 We also had to have the candy bar made out of state by a sympathetic union. In the end the local union leader, Jethro Head, brought the project back to the factory, handing out the candy bars that represented the workers’ ideas and literature about the union’s goals. But I always remember the head of the plant who put his job on the line because he believed in an art project. That was a big deal. Daniel Martinez’s project had two aspects: a parade and an outdoor installation. For the latter, we got all this granite from UIC that was dismantling the raised pavement that was part of Walter Netsch’s building scheme. A fortune in granite was diverted for a time on its way to the salvage yard. The people’s plaza that Daniel imagined was going to be constructed on a City-owned block of the former Maxwell Street Market, and we had received City approval for this. But some board members got worried that the mayor might not be pleased with us doing this. At the proverbial 11th hour (at 11:00 p.m. the evening before we were to meet the salvage truck and start placing the granite slabs), a call came in saying we shouldn’t do this. So I “gave a grant” to Daniel to pay the salvage company, and went down to the site early that morning with our installation crew to cut the lock off one of the UIC-owned lots. We didn’t ask permission. There wasn’t time. Anyway, guerilla art has a long tradition in the public sphere. A head UIC administrator came about a half an hour later and said, “What are you doing here?” And I said, “We’re making art.” I think they thought it was easier to let us proceed than risk causing a fuss, because it could have become another flashpoint in the ongoing controversy over closing the Maxwell Street Market. The piece got done and stayed up all summer. It was interesting that Sculpture Chicago didn’t stop us either. Ultimately, this work became the cover of the book. With Iñigo Manglano-Ovalle’s project, Tele-Vecindario, the process was intensive. He exposed himself daily to the issues of the community in which he lived, all your time consumed with the youth’s problems and the weight of responsibly of what it meant to work there with them. It did not become Inigo’s regular mode of practice, but I think it came at a good moment in his career and, I would say, it affected where he went in his own work. Inigo brought a lot of critical intelligence to the program, understanding questions of audiences and diverse publics. Of course, the process he did set out, not controlling the conversation but responding and shaping it, gave others a role, a buy-in, while building an infrastructure for what was to come—even though there was never a grand plan that forecast what that would be. That’s why the Community Television Network staff members who worked as part of this and the social worker, Nilda Pauley, at Wells High School could join forces at the conclusion of the exhibition and create something else. They created Street Level Video, now called Street Level Youth Media. DT: Along those lines, can you talk about projects that have legacies like that? MJJ: Street Level Youth Media is the most obvious example of legacy. They are coming up on their 20th anniversary. It is an institution that serves 1000 youth each year, teaching them skills in media technologies and using art strategies. They aim to cultivate a consciousness of self in society, with a goal of helping less advantaged students be competitive in college. There are individual stories here, too, like Paul Teruel who was a there at the beginning, became a founding director of Street Level, and went on to develop community partnerships at Columbia College Chicago. But Street Level brings up an issue which public art practioners need to be cautious about. If our goal had been to create such an organization from the outset, I believe the exploration would have been lost, the process would have been narrowed to focus on implementing the founding of an organization. But we could not have defined this outcome at the start. It had to find its natural, necessary way as a shared agenda among a broader set of stakeholders—and first they had to find what stake they had in common. Undertaking temporary artworks enabled them to see that and feel it. Funders would have liked us to have expressed clear outcomes, tangible goals; today they are often mandated in grant making process. Instead what happended came about in a real, organic way. But “organic” was taboo then, as was intuition, because these were not valid business-like words. Yet good creative processes define intent and then listen to the process and let it go. That is exactly what Tele-Vecindario did as an art project, and this allowed it to fluidly lead to Street-Level Youth Media. There were also so many beautiful acts of generosity on the part of all the artists. For instance, we were offered a small gallery on the first floor gallery of the MCA (this was the former building on Ontario Street), because they had a gap in their schedule. I think they thought we install documentation to orient visitors to the “Culture in Action” projects around the city. But I felt the gallery was too significant a space for that; it should be a work of art. So I asked Inigo to do something. None of the other artists complained that this opportunity went to him. Acts of generosity. Inigo made a piece called Cul-de-sac, which dealt with the new anti-gang law and the City putting in cul-de-sacs to segregate communities and contain gangs. 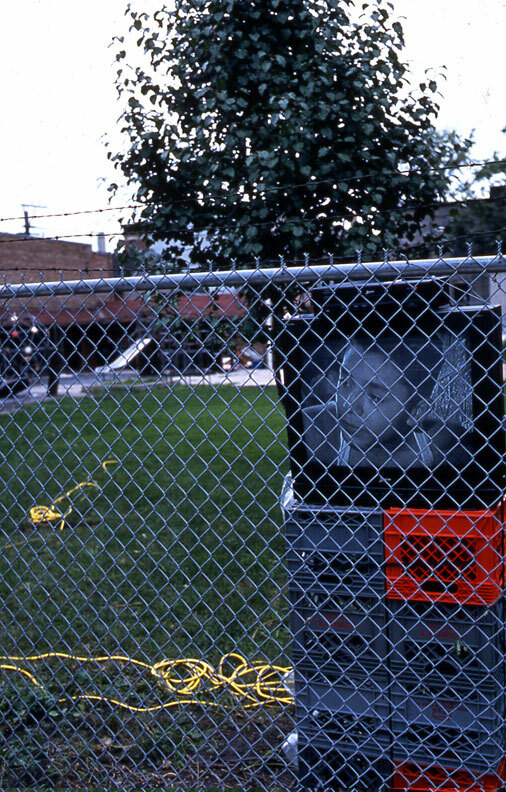 He showed videos behind cyclone fencing, as would later happen with actual fencing on Erie Street in West Town. So this work also became a model, a maquette in a way, for how the first block party, which was a major art installation, ended up looking. It also became a lesson for the youth involved to find their way into the museum for the first time and enter without fear. This was one of the things that Inigo did: bridge the hierarchy between the mainstream institutions and the non-art world neighborhood for these students who thought the museum was not for them, who were intimated to actually “pay what you wish,” and who found guards intimidating. This show also proved to be a way for many museum patrons to see the students’ work because, conversely, they were fearful at that time to go to the block party on Erie Street west of Ashland. RZ: You were mentioning a concern about how outcomes are talked about now. And I wonder, is it possible to find ways to celebrate outcomes without imposing expectations that there will be a certain outcome? MJJ: Oh, definitely we can celebrate outcomes after they happen and celebrate the potential for outcomes. Not predetermining outcomes does not mean there is not a desire to have an outcome. The concern is in determining the outcome before you have done the research, worked with others, and tried some things together. A temporary artwork is not an outcome—it is a product of a process, a gesture, and it can be a meaningful gesture. An outcome can be an organization like Street Level or a new mindset; it can be a change in the art field. In all these ways outcome implies something more. I don’t want to use the word sustainable here, because some things can be wonderful for a short time or for, you know, a longish time, like ten years. Not everything has to be sustainable forever. I speculate on outcomes all the time with artists, but I work with those who do not become fixed on what they want others to do. The outcome has to come from another place, another space. In “Culture in Action” we were in the same stew together. We had questions about public art; we had questions about what art could be; how communities could be involved and we had a stake in how could artists actually make change. Those things were either in the back of the mind or the front of the mind of everyone, but it was in some part of the mind for everybody. So maybe that had some effect, left some legacy, too. DT: Were there any other legacies you want to discuss? 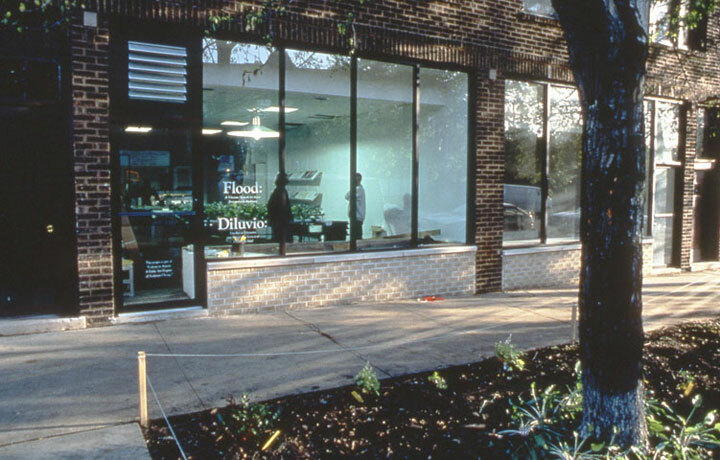 Haha’s Flood might have inspired green developments in art, which certainly John Ploof and Laurie Palmer, artists in the project, have continued. 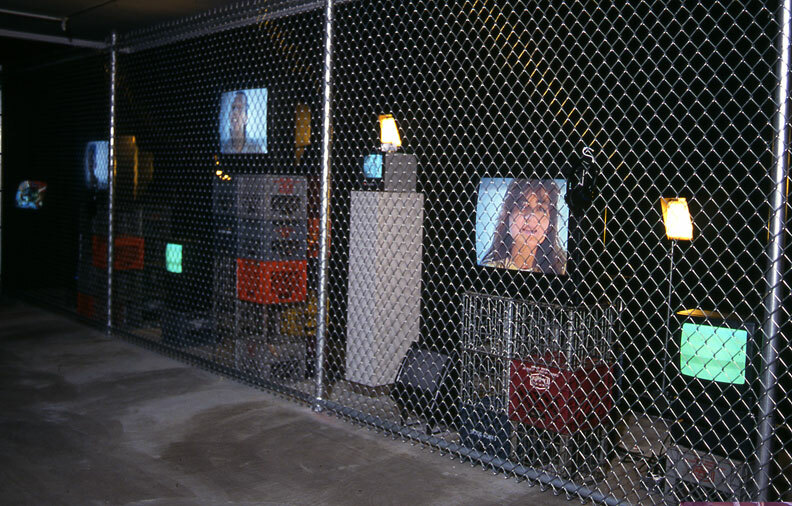 From Mark’s project, MCA curator Naomi Beckwith, then a student, emerged in the field. These may be outcomes. This may indicate validate that in order to actually analyze these projects, you have to analyze them like medical research—over a lifetime—not just in the time of the artwork because the art keeps working. DT: At the time how did you try to show the project to people in the art world so they could understand its complexity? MJJ: Well, there was New York Times critic Michael Kimmelman who I meet at the Venice Biennale and who said, “there’s nothing interesting here.” I said, “Well there’s something interesting in Chicago,” and he came the next week. Of course, since these projects existed over time as well as in different places in the city, it was challenging to show him what was going on and for him to grasp the whole. Still there were things to see and people to meet in order to get a sense of that moment. So he did a great job keeping pace with the energy up of the day as he different realities were thrown at him. DT: This was during “Culture in Action”? 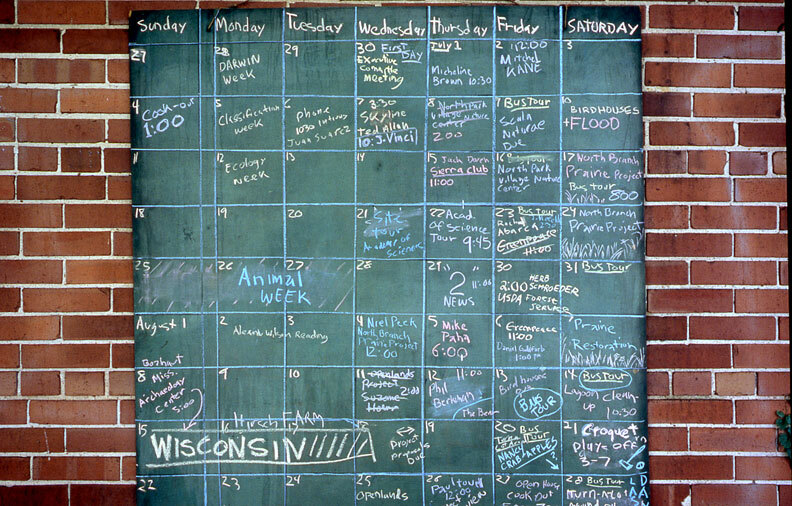 MJJ: This was during the summer of 1993. But we also offered something like this to anyone who signed up fro a tour; it was a demanding bus tour—five hours—led by Rebecca Keller, who is an artist now doing site and community projects. Every tour was a little different because time wasn’t static for these projects; each time we unpacked together what was being experienced. It ended with a box lunch and discussion at the Haha garden project. But controversy arose in the art community around public art around: who’s the author; ethically, how long does an artist need to work with a community; what does the artwork look like? DT: I am curious if you have anything else to say about the differences between that moment when you were initiating it and now, because I feel like you really defined the moment well in your essay in the “Culture in Action” catalog. RZ: In some ways this kind of practice has become more institutionalized. MJJ: Well, that’s not necessarily negative. Things that were questions before aren’t now. So, I don’t think co-authorship is such a problem for the art establishment. Questions around curator as artist have settled down, so that curating is seen as a wider practice that includes not only commissioning but also being part of the creative dialogue. I think that there is greater consciousness of process and what it means to follow a process. Some of the questions around the evaluation have led to an appreciation of qualitative over quantitative means, and the need to invent new ways of carrying out evaluation. Certainly at this point the big questions, or the big issues, of society that were touched on in programs like “Culture in Action” are accepted as part of the terrain of artists’ work. So while I think questions about what art can and cannot do are always there, we see a continuum of answers and artists’ practices. I don’t want to make it sound like everything is great, but today there are a lot more artists working outside the museum and undertaking a wide range of practices. So the same artist can do a public artwork and work for a museum. I think having those options or the chance to have a multiplicity of practices is one of the things I try to instill here at the School of the Art Institute of Chicago. I encourage students to try their hand at public practice or be part of a team, and to know that this doesn’t mean they can’t do their own thing—make work, show it, and sell it. But knowing something about public practice can make students more open to this kind of work by others and not accusatory that it isn’t art, which was what we experienced so often with “Culture in Action”. Even more so, they can be more sensitive to the presence of the audience—and that is important for any artwork. When I began here at the School about ten years ago, talking about community in the classroom was rare; now it is different and it is an expanded and more nuanced, richer conversation. So this institutionalization, if you will, seems to me a good thing.